Welcome to the iCourt Project Information Site! The Idaho Courts has changed the way we do business by shifting from a legacy paper-based system to a modern electronic online judicial system. 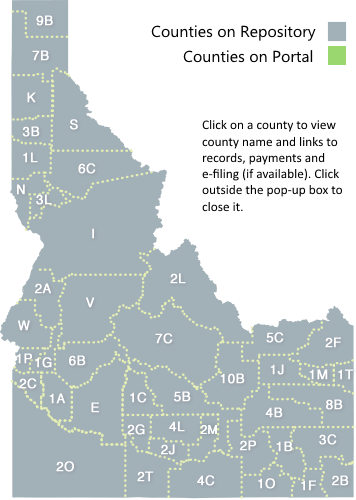 Idaho has transitioned statewide to the new iCourt system where citizens can search for court records, make payments, or get county contact information. This website will provide updated information and resources throughout the life of the project. To learn more about the iCourt suite of solutions, click here. To search records or make payments, please make your selections below or click on your desired county on the map. To search records or make payments, please make your selections below or click on your desired county on the map. • There is a 3% credit card transaction fee on all online payments. • You may need to disable your pop-up blocker.